The faculty of Allied Medical Sciences organized a celebration of the mother’s day on Tuesday, 19 March, 2019. This was held in the presence of Prof. Ezzat Hassan, the faculty dean, academic staff members and 100 students. 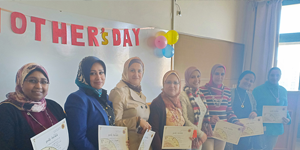 In a gesture of gratitude and appreciation of their efforts, Prof. Ezzat Hassan honoured the faculty’s academic staff members who are mothers as well. The celebration was held from 12.30 pm to 2.30 pm- room G 616 at the Educational Building.